Performance on the corner of Bree and Sauer. Johannesburg, October 2013. Video still courtesy of Tanya Gershon. While music and performance have the capacity to transition Johannesburg’s CBD from a place of spatial control to a place with transformative possibilities, government cultural improvement policies and neo-liberal urban development stand in opposition to artists attempting to invent and reimagine the Afrofuture city.1 Under the controversial guise of a “World-Class African City” marketing campaign aimed at attracting international business and tourism, city officials concentrate their efforts on “enhancing the cultural landscape” through public art sculptures, piazzas, and infrastructural upgrades mirroring westernized tropes.2 Nonetheless, wrought with a tumultuous history of spatial politics and unique urban planning conditions, many of the city’s large communal squares and parks remain empty shells. Conversely, the streets croon with a pulsating energy throughout the day—supplanting squares and plazas with sidewalks and street corners as the real public spaces in Johannesburg’s CBD. 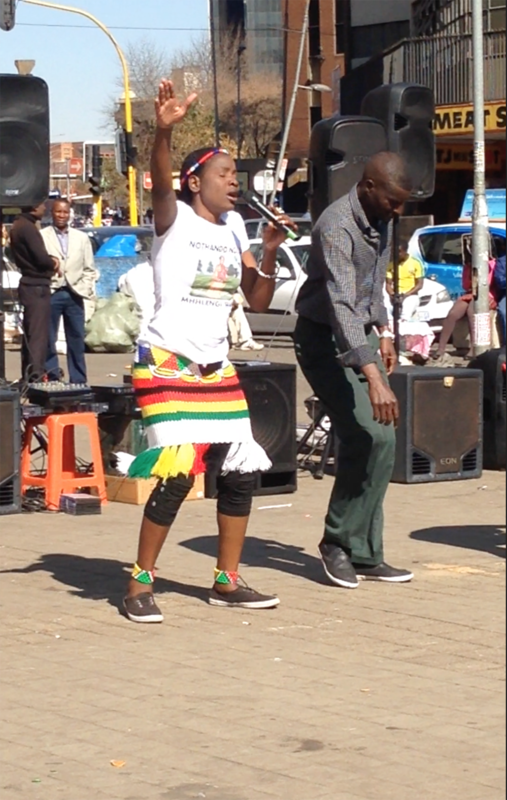 Determined to reach the people on the ground, street performers identify with their audience through endemic performances filled with pan-African song and dance, bringing the music to the busiest thoroughfares in Johannesburg. Despite their success in invigorating the CBD, certain impediments hinder these artists from gaining a legitimate position: the historical fear of public space, the government’s desire to become a “World-Class African City” and the cryptic permitting process utilized to control public gathering. Rather than acknowledging street artists as part of a common cultural solution to transform urban space, the city appears to render them invisible. The biggest hurdle for the artists is gaining a platform to perform, and their largest obstacle is obtaining a permit. 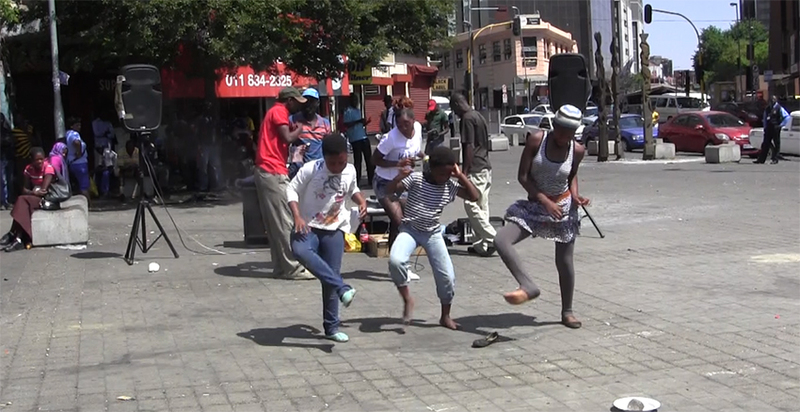 Video of performances on the corner of Bree Street and Sauer Street. Displayed at Taking It to the Street exhibition at Studio X Johannesburg, March 2014. Video footage courtesy of Tanya Gershon. The co-existence of informal and government-sanctioned performance spaces calls into question the psychological factors at play. Why do locals go out of their way to avoid sanctioned public space in favor of corners such as Bree and Sauer? The highly sanctioned Mary Fitzgerald Square in the Newtown Art precinct sitting virtually empty a few blocks away from the corner of Bree and Sauer. Johannesburg, October 2013. Video stills courtesy of Tanya Gershon. At the same time the world was rising from the travails of World War II and genocide, South Africa transitioned from decades of brutal racial segregation to a codified and state-sponsored apartheid. Through widespread media censorship and normalized acts of violence, the government constructed a plan to dehumanize its black citizens, confining them to townships at the local level and Bantustans at the national level. Johannesburg’s CBD was situated at the center of apartheid maps, as a symbolic icon of the segregated city and a space for the wealthy elite to run the global diamond and mining industries. 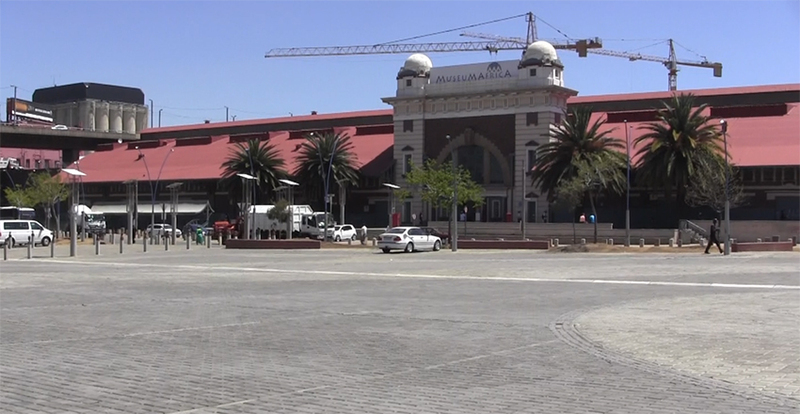 While white South Africans enjoyed the luxuries of the CBD’s public spaces under apartheid, black South Africans associated these sites with fear and surveillance. Although many government acts enacted under apartheid enforced segregation on an urban scale, the legislation also extended to the psyche of the individual through the Abolition of Passes and Coordination Documents Act of 1952, requiring non-European citizens to carry passbooks as a form of identification. Passbooks contained the individual’s racial designation, and specified the areas in which they were allowed to reside in and travel through. These passbooks became people’s identities and, if caught without one, victims could be subject to brutal interrogation by law enforcement. The 1956 Riotous Assembly Act No. 17 prohibited “any outside gathering that the Minister of Justice saw as a threat to public space…it allowed the government to ban any gathering that could cause hostility between black and white people.”3 Therefore, public gatherings were categorized as political events punishable by force. The same legislation created to protect white South Africans effectively made public space exclusionary to black South Africans. The 1994 National Regulation of Gatherings Act, enacted under the post-apartheid government, repealed several laws prohibiting government protest and gathering in public spaces. The act was meant to represent a new democratic South Africa, with a forward-thinking preamble that states, “Every person has the right to assemble with other persons and to express his views on any matter freely in public and to enjoy the protection of the State while doing so.”4 Despite the initial promise of freedom of speech and expression, the Gatherings Act served the opposite purpose: minimizing public communal activities rather than promoting them. The legislation positioned the Metro Police as the most crucial element in maintaining peace at gatherings and demonstrations. Today, the Metro Police enjoy an extraordinary degree of autonomy, which has led to corruption, bribery, and exploitation of the vulnerable migrant population living and working in the CBD. 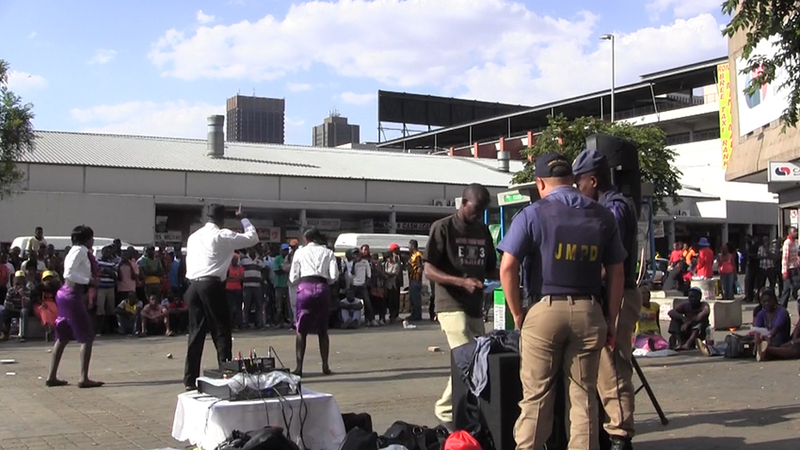 Metro Police checking the performance permit and Asylum Seeker Temporary Permit at the corner of Bree and Sauer. Johannesburg, October 2013. Video still courtesy of Tanya Gershon. The underlying concern that public outdoor spaces will be used for demonstrations against the government presupposes that public gatherings will require reactionary force. As performing artists attempt to distance themselves from the residual fear of communal gathering, they are forced to contend with a history of stereotypes that render them violent participants in public space. Under the historic backdrop of surveillance, distrust, and fear of public assembly across the country, public space remains suspect, contested, and unwelcoming to the victims of apartheid. At the same time, the upper class, who once spent their daily lives in the CBD, are now terrified to return even with maximum security and the promise to remove any “threatening bodies” from public space.5 Both parties do not feel welcome, placing suspicion upon current government strategies that attempt to remove “foreign bodies”–migrants, poor people, street traders—from the CBD. Who, then, is the city actually designing and building public space for? In “Sounds in the City,” African cultural studies scholar Xavier Livermon captures the feeling of walking through the streets of the CBD during the day. He refers to the music and sounds of the street as “forms of urban social memory.”6 Livermon takes the reader on a personal journey through the street vendors lining the streets, hair braiders picking up clients passing by, music spilling out from storefronts onto the sidewalks, and shared taxis weaving in and out of taxi ranks in a synchronized dance with pedestrian foot traffic as he writes, “I have been struck by the extent to which the feel of [Johannesburg] is reflected in its sound…and music in particular [as] key channels of an Afro-cosmopolitan identity. Music has not only been central in the city’s formation. It has contributed to its high levels of social energy, which made [music] permeable, flexible, and defiant, especially in times of struggle and racial conflict.” 7 Livermon’s vivification of the street affords a glimpse into why he celebrates the “Afro-cosmopolitan identity” over a misguided desire to clean up the city through public spaces imported from Western cities built under different circumstances and social conditions. Walking through the CBD. Johannesburg, October 2013. Video still courtesy of Tanya Gershon. The Johannesburg Development Agency’s (JDA) mission is to transform Johannesburg into “A World-Class African City” through an ambitious deployment of public art. One of the main goals of their public art policy is “to support the development of the public art industry in South Africa.”8 Performing artists are currently not considered in this policy and planning effort. 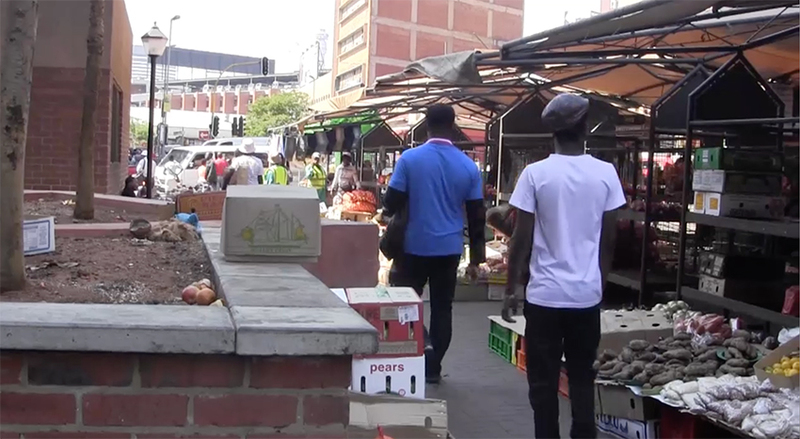 As Johannesburg seeks new ways to improve the CBD, their intended audience is international tourism without accounting for its current migrant population. Walking down Bree Street. Johannesburg, July 2013. Video still courtesy of Muhammad Dawjee. In the rebuilding of the CBD, the government continues to ignore the distinctions between itself and other metropolises around the world. 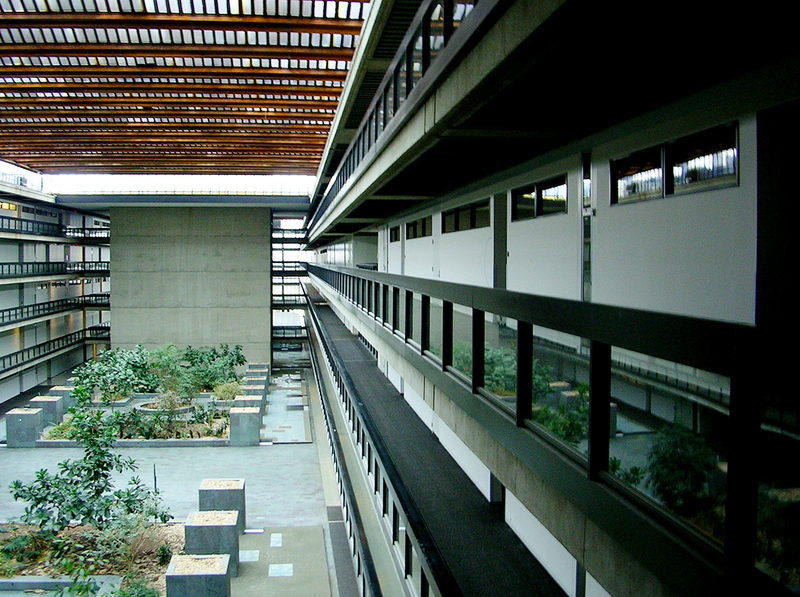 Rather than adapting existing spatial conditions in the city, the government overlooks existing successful design solutions in favor of their own regeneration plan. Instead of incorporating design ideas from the urban furniture of street traders, the stages formulated by performing artists and the advertising stations created by hair braiders, the government implements City Improvement Districts (CID) and privatizes streets, effectively eradicating the ad-hoc cultural vibrancy by privatizing it, severing the link between the artists and their artistic practice in the public realm. Large-scale map showing performance zones and travel distances for the artists. Taking It to the Street exhibition at Studio X Johannesburg, March 2014. Photograph courtesy of Tanya Gershon. Situated in the cacophony of an intersection for commuters navigating through the Metro Mall Taxi Rank, traders, shoppers, and vehicular traffic, this corner is the most coveted space for weekend performances in the inner city. 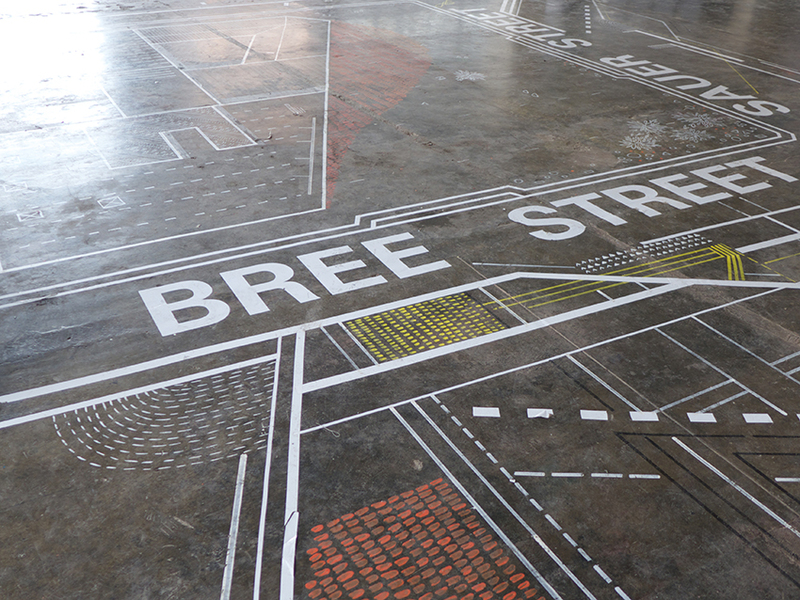 The corner of Bree and Sauer operates as an important node in the city’s informal performance network. Street artists use this corner to reach surrounding communities—especially those people passing through town—and to bring inner-city residents together through a shared love of music and dance. While the corner does not have the infrastructure to support these performances, like seating or electricity, it is the artists that draw people to stop and listen to the music. 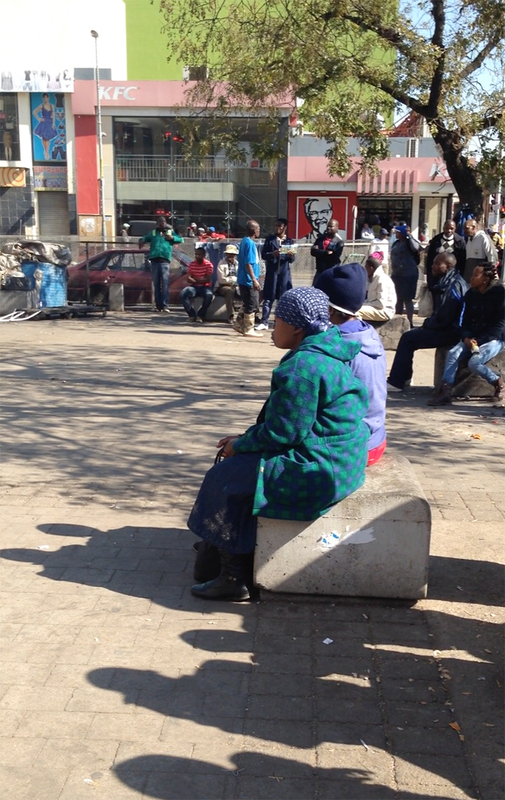 At this edge, street traders sell to people passing by until the Metro Police seize their goods. When a performance is taking place, the traders provide food and drinks to the crowd, which materializes in a matter of minutes. 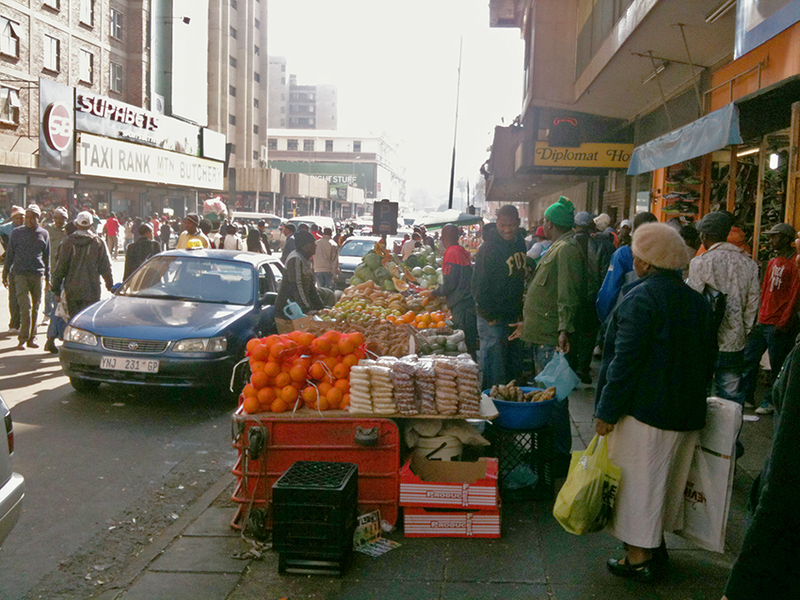 The informal economies work together supplying goods and entertainment to the public. Woman sitting on a street bollard during a performance on the corner of Bree and Sauer. Johannesburg, July 2014. Video still courtesy of Tanya Gershon. At some point during the performance the speakers, supplied by and paid for by the artists themselves, are at risk of being seized by the Metro Police who cite inadequate permits as they hand over a ticket that includes a substantial fine. The speakers are supposed to go to a warehouse for the performer to pick up after they pay the ticket fee, but in several interviews that I conducted performers noted while they finally got to the warehouse and paid, the speakers had never made it there. The legacy of apartheid and its influence on public space is manifested in the permit required to use public space for performance. 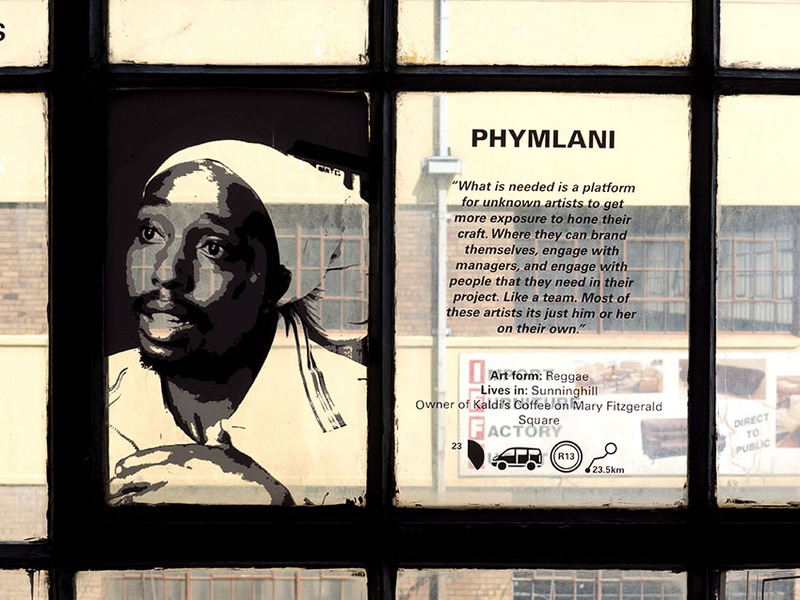 If an artist can navigate the permit, then Bree Street becomes a platform for them to express their artistry despite remaining an unwelcome presence to the city. Complex screening processes by government officials, which determine who is and who is not permitted to access space, have severely limited legitimate public gatherings. While the apartheid government relied heavily on passbooks to classify people, along with bylaws and other documentation to govern space, post-apartheid legislation uses more subtle means to control and limit access to the public domain. Government acts mandating permits are buried in online databases that contain all of the bylaws of South Africa. Moreover, accessing the Internet is extremely expensive in Johannesburg, and it is not accessible to many of the citizens who perform in the CBD. When the regulations are ascertained, the location to acquire a permit and the necessary documentation required to apply for the permit are not available online.10 Currently, the only way to find the correct permit-issuing office is through word of mouth. 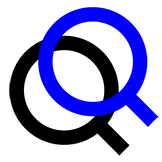 This challenge instigates formalized networks of artists coming together to transcend the cryptic bylaws that constrain them and invent creative ways to perform in public space. A few years ago I witnessed a performance in the CBD made possible by one woman from Jeppestown named Nothando. I watched Nothando as she set up her generator and speakers. Her sound check served as a communal call, signaling people from all directions to take their seats under the shade of the trees—appropriating street bollards and flower boxes as seats once the show began. Over the course of seven hours, eleven different cultural and spiritual groups performed powerful ballads with synchronized dance routines, gospel music and traditional maskandi. Vibrant costume changes transformed the performers into entertainers. I quickly learned that this is a weekly performance, repeated by various groups each weekend. Interviews with the artists illustrate the organized network created by street performers who come together through a shared commitment to bring art and culture to the people. A single person applies for a permit and shares the space with other entertainers, splitting the cost of transporting the equipment and petrol for the generator. Nothando setting up the performance on the corner of Bree and Sauer. Johannesburg, October 2013. Video still courtesy of Tanya Gershon. Nothando’s journey to apply for a performance permit began in 2009, when she left Zimbabwe in the hopes of a better life in South Africa. Under the Refugees Act No. 130 of 1998, Nothando was able to obtain an “Asylum Seeker Temporary Permit,” which granted refugee status and legal rights. When I first met Nothando in 2014 she told me that she, “is a good friend.”11 At the time I did not yet understand that she was the link between all of the performers at Bree and Sauer. Though Nothando does not think of herself in this way, her presence in this space and her initiative to organize permits and performers helps to supplant stereotypes of decrepit violence in the CBD. Nothando managed to create an informal network in which artists feel empowered, where they stake their claim to the city using their craft to bring people together through vibrant cultural performances. However, she and her fellow artists lack government support to streamline the permitting process to make it more accessible and include more performance opportunities. I have come to understand that the tedious, opaque permitting process coupled with the difficulty of procuring an Asylum Seeker Permit renders it almost impossible to legally provide entertainment to the public at the corner of Bree and Sauer. 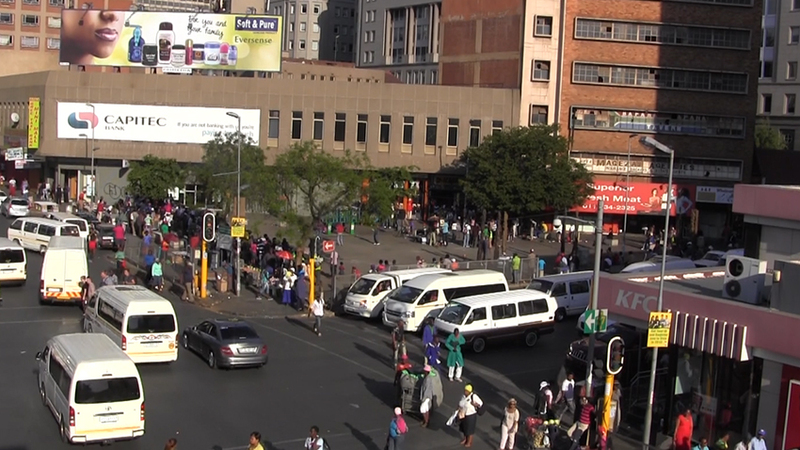 This intersection is completely controlled and monitored by the Metro Police who came to ask Nothando for a “noise permit” and other documentation at least once an hour over a seven-hour Sunday session. The lingering presence of the police in the space serves as a constant reminder that even with proper authorization, this place does not belong to the inner-city tenants, migrants or commuters into the CBD from surrounding townships and suburbs. Drawing frightening parallels to the inspection of passbooks during apartheid, the South African Police Service (SAPS) or the Metro Police can request to see Nothando’s permit and ID at any moment. She must carry this document with her at all times or risk being deported. Nothando performing on the corner of Bree and Sauer. Johannesburg, July 2014. Video still courtesy of Tanya Gershon. The interviews that I conducted with the artists uproot the outmoded fallacy that CBD performers are impoverished street performers. Many are employed during the week, often traveling greater distances to perform in the inner city over their weekend than it takes to get to their official places of work. Their commuting cost to and from the CBD far exceeds the funds that they receive while performing. The artists remain committed to their craft not due to monetary gain but because they fundamentally believe in their inalienable right to share art and music with others. At the risk of being fined and/or arrested, the artists that I work with believe that they are enriching Johannesburg’s urban life and public spaces. While the inner-city charter seems to advocate for new artistic platforms for public art, it is clear that these policies do not account for the artists who currently perform in the CBD. As Johannesburg attempts to rebrand itself as a “World-Class African City” the policies contribute to a disjunction between the content and the form of the city, and the intended audience versus the actual audience. In order to create meaningful site-specific art interventions rather than perpetuate a fragmented public infrastructure, planners and policymakers must build upon the street performers’ knowledge of the city and engage in a dialogue with them. Street performers facilitate an energy that simultaneously commands attention and demands pause in the daily bustle of the CBD, determining and amplifying the rhythm of the street. Nevertheless, the street performer remains an outsider—constantly battling for validation and dignity in an arena that is intrinsically against their presence in the space. Artist’s Stories. 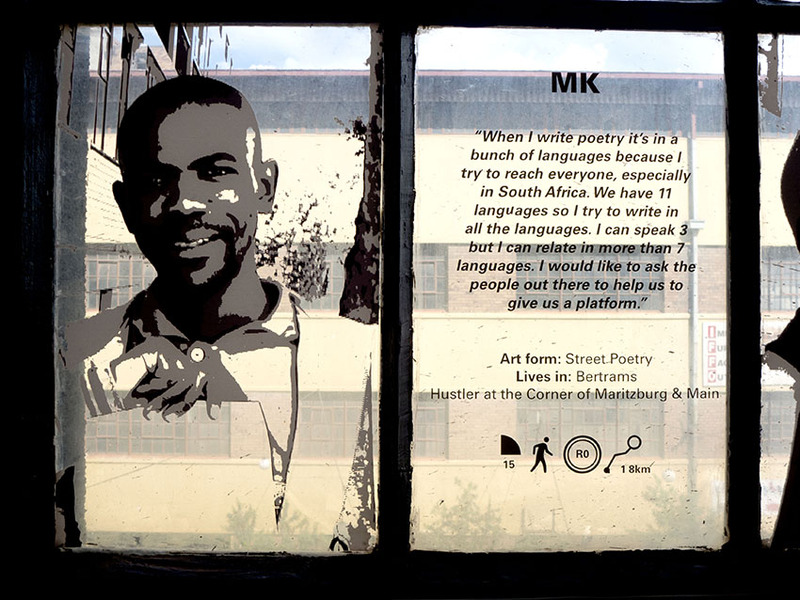 Taking It to the Street exhibition at Studio X Johannesburg, March 2014. Photograph courtesy of Tanya Gershon. Floor of Studio X. Taking It to the Street exhibition at Studio X Johannesburg, March 2014. Nolan Dennis and Fuzzy Slipperz, artists. Photograph courtesy of Tanya Gershon. 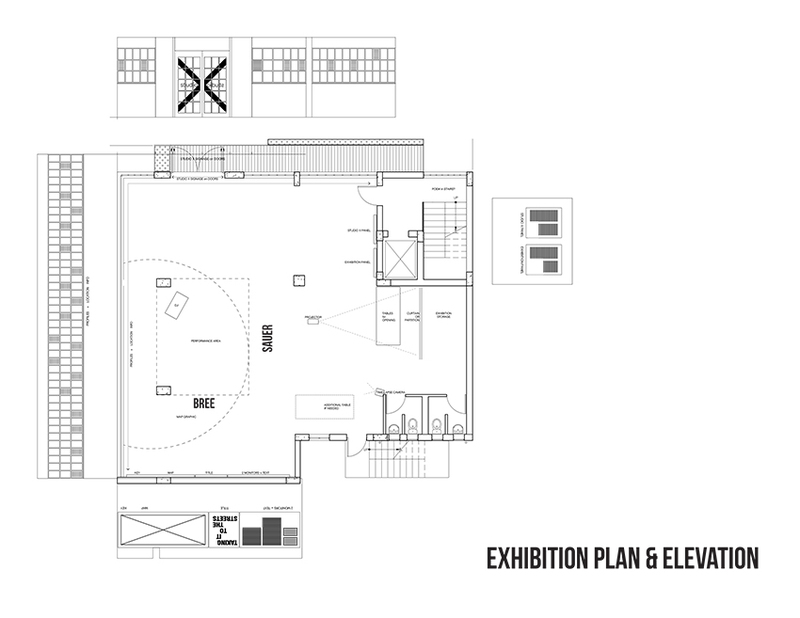 Exhibition Plan and Elevation. Taking It to the Street exhibition at Studio X Johannesburg, January 2014. Drawing courtesy of Tanya Gershon. Exhibition Panorama. 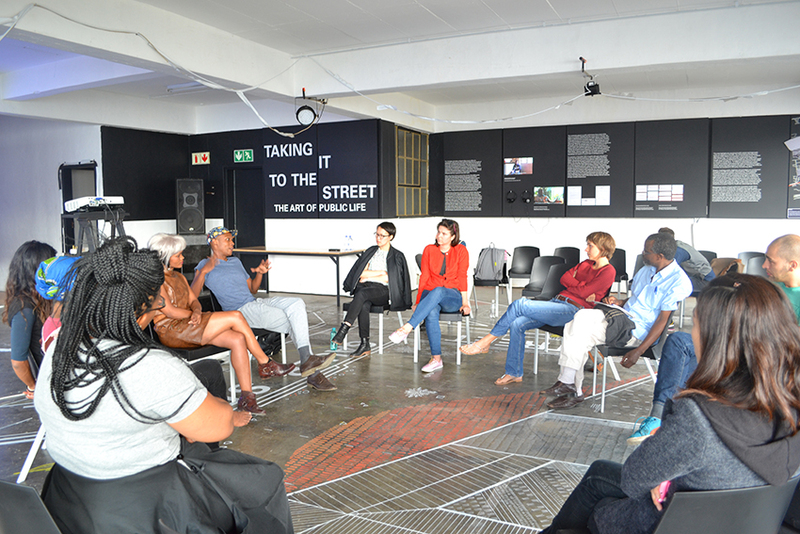 Taking It to the Street exhibition at Studio X Johannesburg, March 2014. Photograph courtesy of Mabel Wilson. Exhibition Lecture with the Curator. 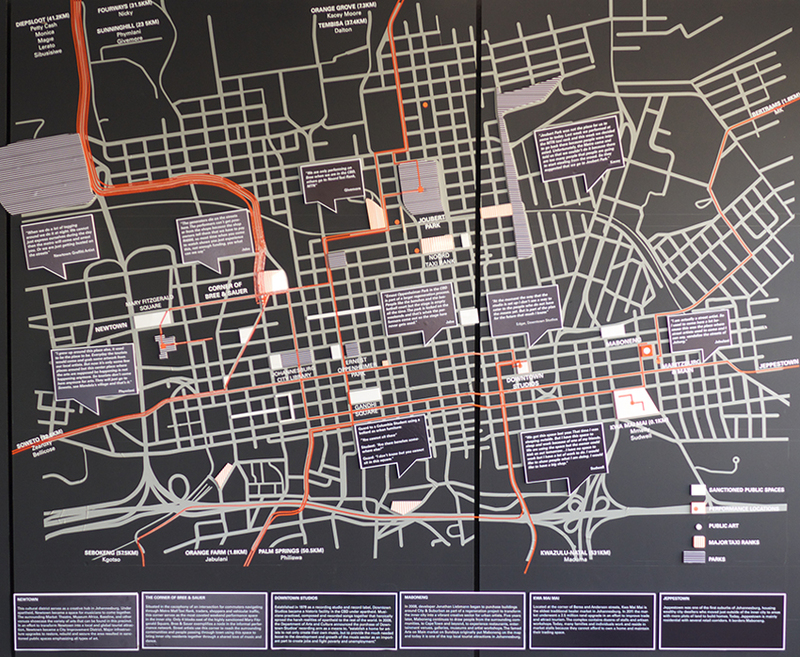 Taking It to the Street exhibition at Studio X Johannesburg, March 2014. Photograph courtesy of Mabel Wilson. Workshop with Noluthando Lobese. Taking It to the Street exhibition at Studio X Johannesburg, March 2014. Photograph courtesy of Tanya Gershon. Tanya Gershon is an architectural designer and curator based in New York. 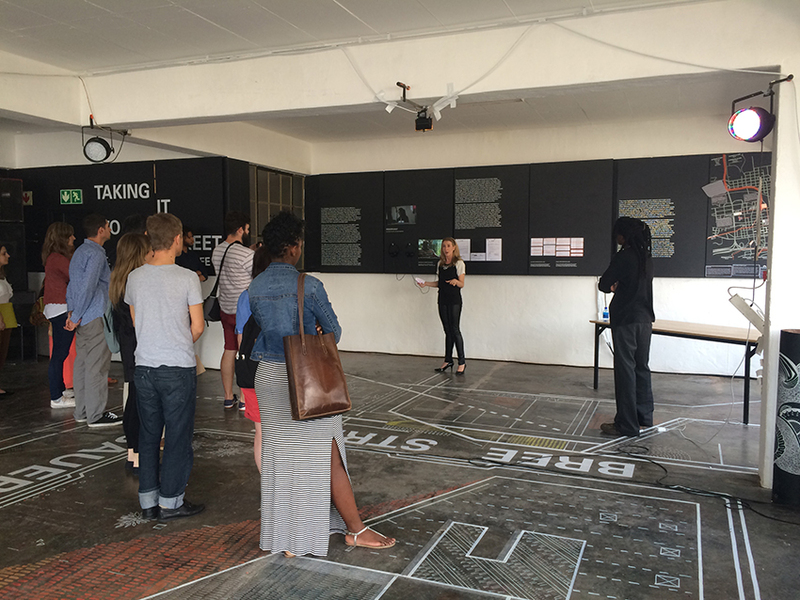 In 2014, Gershon designed the opening exhibition for Studio-X Johannesburg, titled “Taking It to the Street, The Art of Public Life,” exploring the intersection between public space and the labyrinthine permitting process street performers undergo to work in Johannesburg. Her practice attempts to instigate change in perceptions toward street artists while advocating to streamline the permitting process required to perform in public space. In 2015 Gershon founded SASAI (South African Street Artists Initiative).